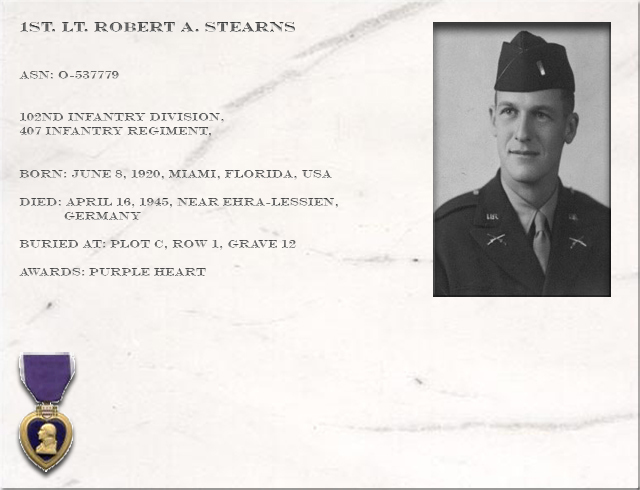 Robert Arthur Stearns was born on June 8, 1920 in Miami, Florida. His parents, Frank F. Stearns from Wisconsin, and Helen Conlon Stearns, from New Jersey, were married in Miami, Florida in 1912. Robert (Bob) was the youngest of four sons. He attended schools in Miami, and even when young, was recognized for having a good singing voice. He sang and soloed in the Miami Edison High School chorus and glee club and in several downtown Churches. As a young boy, Bob was very mature for his age and always called our dad's business acquaintences by their first names, and they seemed comfortable with that address, while the rest of us called them "Mr.". He constantly was heard practicing singing in his bedroom with Caruso and Nelson Eddy as mentors. He attended the University of Florida, Gainseville, Fla on a singing scholarship and did well until he received a broken jaw in an intramural boxing match. This interfered with his voice training activities for awhile. He was a member of the Reserve Officer's Training program on the campus (ROTC), and at graduation, received a commission in the US Army, along with his business degree in accounting. Following graduation, he worked as an accountant at the Miami Jackson Memorial Hospital for a period of time,before entering military service. 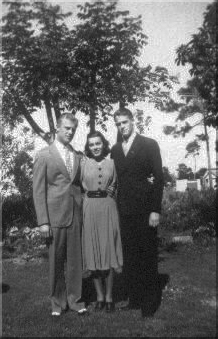 Robert (Bob) Stearns "brother John, wife Marguerite and Bob"
Upon entering the service, while stationed for training at Camp Swift, Texas, he met a student at the University of Texas, miss Helen Hicks. After too brief a period of courtship, they fell in love, and Bob and Helen were married in the Chapel at the University of Texas. I, as his brother, served as best man. At that time I was an Aviation Cadet in training at a school in San Marcos, Texas, south of Austin. I will always remember Bob as being an officer type with a gentleman's attitude. He was well liked by everyone who knew him. Bob and Helen had a short honeymoon in New York on his way to the embarkation point in New Jersey, where his unit departed for Europe in September. His unit arrived in France Sept 1944, crossed into Belgium and Holland Oct 1944 and into Germany, November 1944. 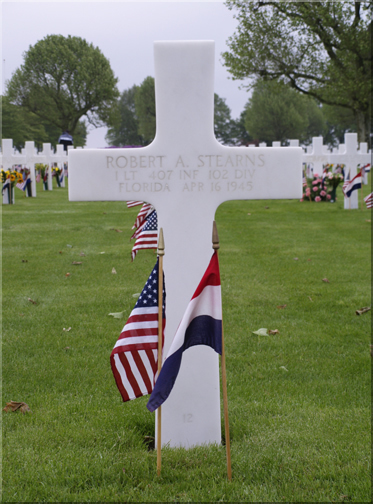 Our older brother,Foster, was in the army in Europe at the time Bob was killed. 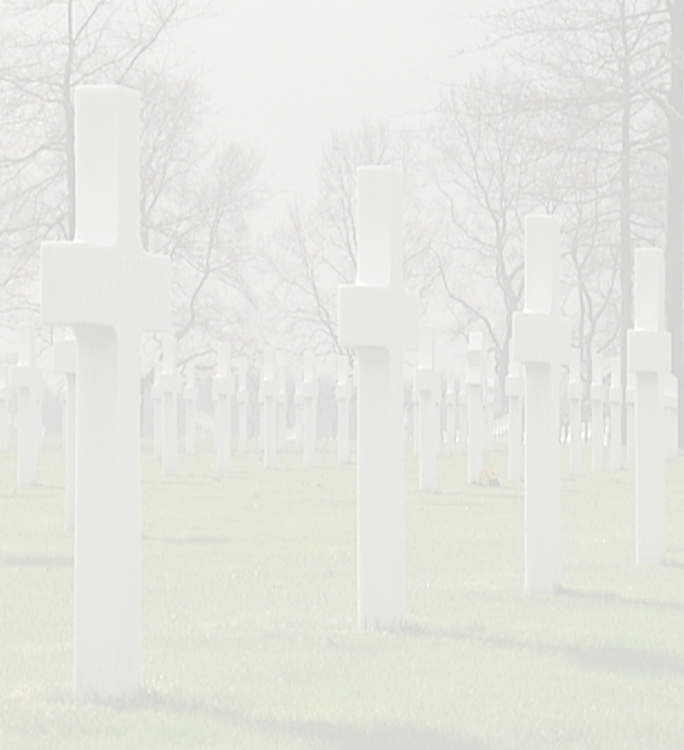 I remember his telling of being at the gravesite at Margraten and a young Dutch girl standing near him and saying she would care for his grave site for the future. However , I was not able to learn the family name until now. Bob and Helen had no children and she returned to Texas.